One of the really “fun” parts about Type 1 Diabetes is how unpredictable it is. Food, exercise, stress, hormones, the weather – you name it, it all has an affect on blood glucose levels. If you have T1D and are pregnant then you are in all honesty all over the place. Your insulin requirements are through the roof, so once baby comes along you’re pretty much back to square one working out what you should be taking when. So then you add breastfeeding into the mix – a mine field in itself. Your hormones are raging and, if you’re like all the other T1 mama’s I know, you keeping having low blood sugars. Don’t try and look for patterns. I hate not knowing why something has happened, but there is no way of predicting blood sugars when breastfeeding. Go with the flow and try not to stress about it too much. Adjust your basal. If your hypos are constant then drop your basal doses. If it’s only around feeding and you’re on a pump then its definitely time to get to grips with temporary basal rates. They are your friend and can keep you sane! Thats if you remember to use them, I was definitely guilty of remembering too late in the early days as I was too busy trying to stay awake. Embrace the snacks. Breastfeeding makes you want to it eat and it also can have the ability to make your blood glucose levels drop like a stone. So the obvious solution is to eat! I often will grab a biscuit or two as I settle down to feed Piglet. Ask for help. If you’re sitting down and baby has ben feeding for a while, ask someone to bring you something to eat or drink. Obviously this doesn’t work if you’re home alone, but if there is someone with you then they will be more than willing to help you I’m sure! No point disturbing baby when you’ve quite possibly spent a while getting the latch right in the first place. Be prepared. Many people, like myself, have a go-to place for feeding. I can often be found in the rocking chair in his room, so I make sure I have a stash of Glucotabs on the table next to me just in case. I haven’t had to use them yet, but better safe than sorry! Wherever it is you find is your favoured feeding spot, be it the sofa, your bed or in baby’s room, leave some of your favourite hypo treatments readily available. Diabetes – What is Type 1? What does a no-deal Brexit mean for diabetics? Luckily my Type 1 son will never have this particular issue, but I so know what you mean. My best friend has Type 1 as well and when she was breast feeding and chatting away to me, she did a quick bg check 0.6 …. luckily I was there to grab the lucozade as she wasn’t especially with it by that point and it happened so quickly without her realising. I’m sure this post will be helpful for a lot of Type 1 new Mums out there or the pregnant ones having a late night google panic fest. Thank you, its incredible what we can do what we have to! It is worth the hassle for him to remain breastfed though, I never let my diabetes hold me back! As if breastfeeding wasn’t tough enough! Can’t begin to imagine how much harder it must be for those with diabetes. 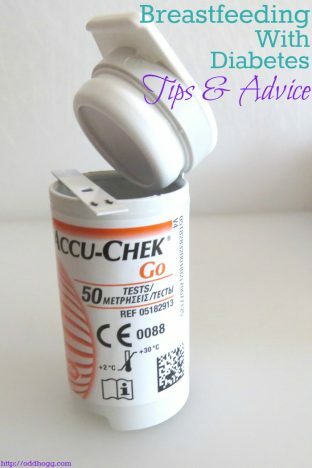 Great tips, even for those without diabetes. Thanks, its amazing what you can do if you have to though. Its all just part of every day life for me!